This is the beginning of our last visit to London this year. Our daughter and her family have completed their assigned year here and we are helping with odd jobs and babysitting while they pack. We spent our first day wandering around Piccadilly Circus, St. James and Regent Places - visiting the Summer Show at Chris Beetle's Gallery on Ryder Street. 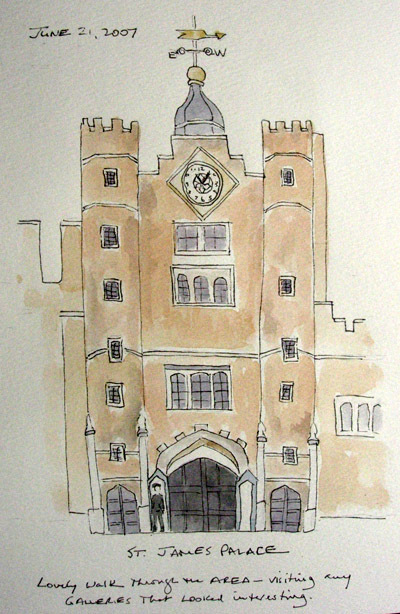 My husband sat on a step across from St. James Palace while I sketched this in 15 minutes. I then added watercolor while we sipped coffee at our favorite Caffe Nero on Piccadilly. We ended by browsing Burlington Arcade and the galleries on Cork Street. While sitting in front of the window in Caffe Nero, there was a constant flow of buses and I was able to sketch a prototype from bits and pieces of each of them. We love riding the buses between Chelsea and our London destinations - sitting in the front seat on the top deck as often as possible.! Nice job, Shirley. It takes me back to our London trip a few years ago. WONDERFUL, Shirley!!!! 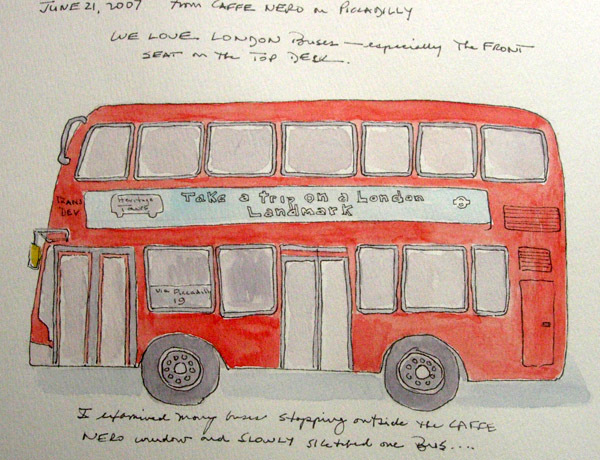 I think your London sketches are just fabulous! As a kid I used to love the buses too, but I never think to use them when I visit now - for some reason I always head for the tube. Uh well! These are nice sketches, enjoy your trip. Great sketches, Shirley! St. James came out really well, and good for you sketching a bus from many moving models. It sounds like a your having a good visit- I hope the weather's holding out. I love visiting a country through someones sketches - these are lovely and lively. These vehicle ones are such fun. You could have some of them made into jigsaw puzzles for your grandchildren - i'm sure there are places that do it.